Routines just make us bored, to sit idol at outdoor to enjoy a family get together can restore a happier person in us! In summers, we all love to spend more of our spare time in garden, at backyard or at any shady outdoor! We are here with plan to get these portions ready for lazy summer afternoon sitting! 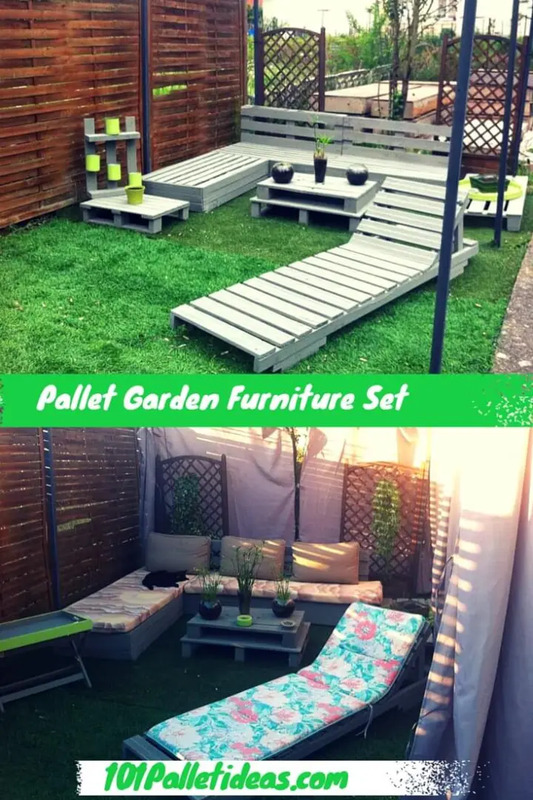 Spend a few hours and build this DIY pallet garden and patio furniture set to for occasional and individual sitting! 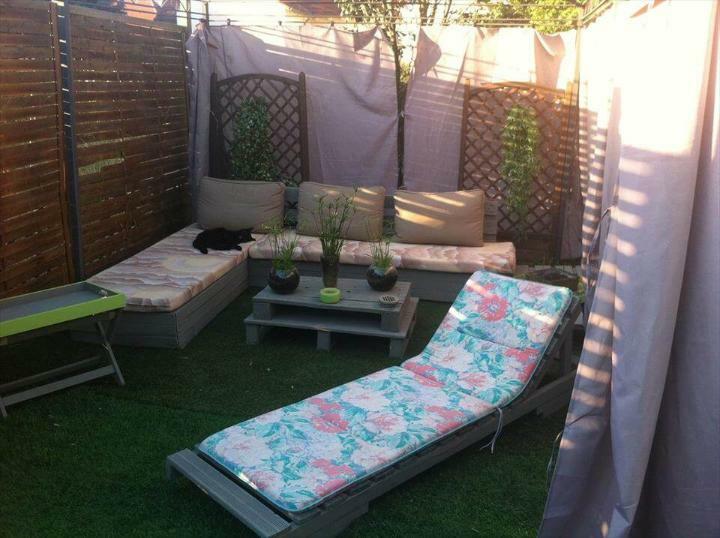 All special has been included to this patio furniture set, a perfect sectional settee, a coffee table and lounger to enjoy the space too along with the garden greenery! Listen up the bird’s music and let the cool breeze sooth your nerves while being at this patio set! There would be nothing more special to relish the outdoor or garden scenery but this handmade patio set built at no-cost budget, amazing!! 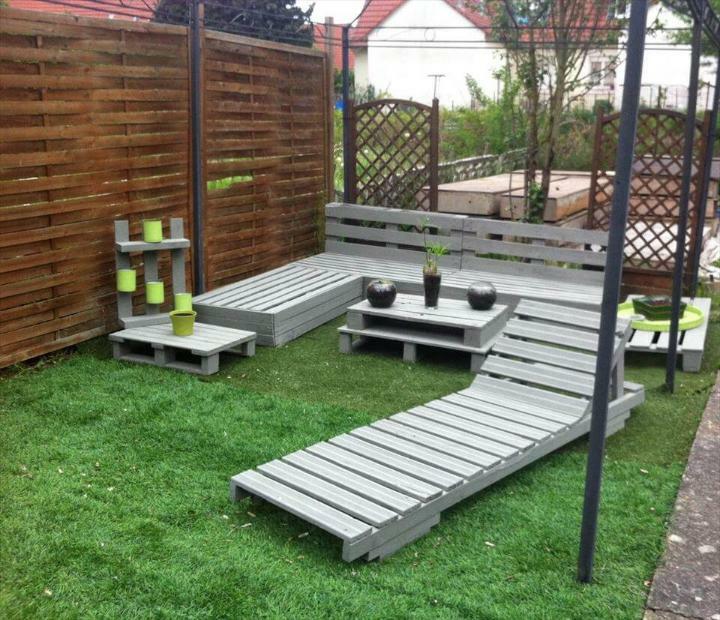 Entire set has been painted in grey for an outdoor friendly look and paint layer would protect it more against weathering! No excess use of money or muscle effort is required here, simple arrange the pallets into new configurations and enjoy sophisticated furniture for your patio and garden! Do add the cushion over for awesome comfort, this will also avoids the wooden angularity and edging to bother you! Use leftover pallet to build a coffee table or a chic planter holder!